Fisherman’s Chapel by the Bay started its active life in June 1984. It was founded by Rev. Arthur Wright, a Lutheran and retired Army Chaplin. After Rev. Wright and his wife, Elizabeth moved to Bodega Bay he felt a call to establish a church here and so contacted the Mount Olive Lutheran church in Sebastopol. They commissioned him to establish a “preaching station” in Bodega Bay and Fisherman’s Chapel by the Bay was born. They began meeting in the Bodega Bay Community Center. 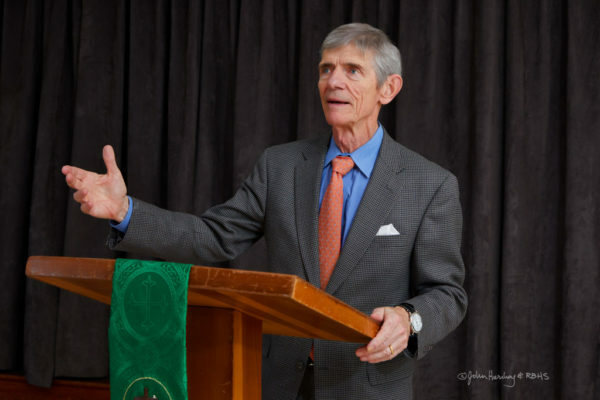 As a preaching station the chapel did not establish formal membership. Regular attendees were considered “adherents”. The first adherent was Natalie Church, a Lutheran and resident of Bodega Harbor. From the beginning adherents represented a broad sample of the community. Residents of Bodega Bay, Carmet, Sereno del Mar and fishermen who had boats in one of the local marinas but lived elsewhere. The Chapel Council ‘consisting of seven members’ oversees the activities and budget of the church. Throughout its history the Chapel has been led by a group of committed and active lay leaders. The Chapel Council oversees the activities and budget of the community. It continues to carry out its Christian mission and stewardship and provides church services and charitable support for the Bodega Bay area. Music is one of the highlights of our Sunday morning worship service. The congregation enjoys singing hymns from the Methodist hymnal accompanied by an electric piano/organ played by one of the musically talented members. On special occasions, another talented member plays the guitar during the service. Rev. Kathy Cramer was called to ministry as her second career. 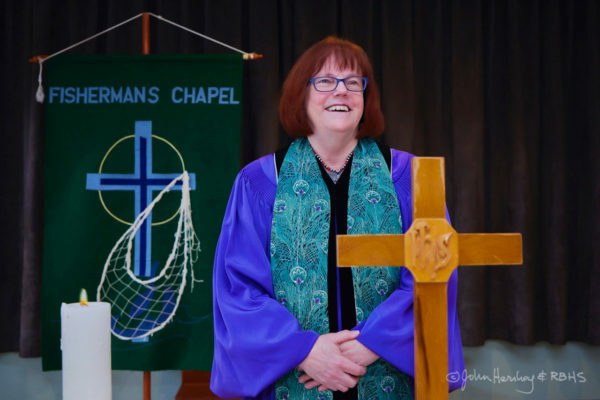 She has a lifelong connection with the Christian Church (Disciples of Christ) and has served in various leadership roles in the local and regional church. Her interest in social justice lead her to become a Social Worker. She worked in that field for over 30 years in both direct service and management positions. While working she earned a Master’s degree from the Pacific School of Religion in 2002 and was ordained three years later. After retiring from social work she became active in co-leading a number of retreats for clergy and lay leaders. Her first professional call was to Fisherman’s Chapel in 2011. She lives in Napa with her husband Alan. Joan Graham Poulos is originally from Kansas, music has been important throughout her life. She started playing the piano at age 8; played both as an accompanist and soloist in High School. In college at The University of Kansas, she sang in the Acappella Choir and covered musical events for The Daily Kansan. Joan started the children’s choir in Potter Valle and joined Davis Chorale when she moved to Davis. She was lucky enough to tour; including Germany, Italy, Hungary, France and U.S. In Bodega Bay she started playing the organ (in the community center) then the electronic piano in the Harbour and now at the Fisherman’s Chapel in the Grange. 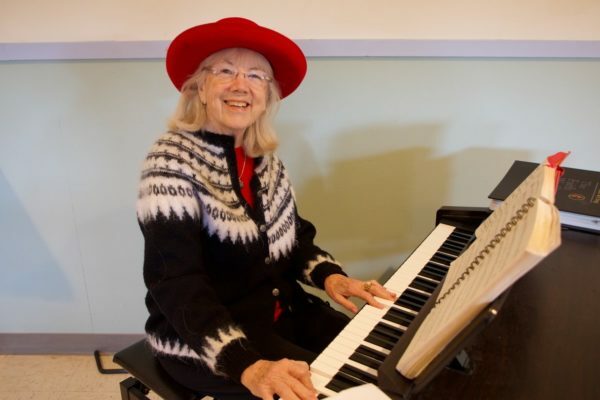 Joan started the community-wide Christmas carol sing for last three years in conjunction with the Bodega Bay Church.